A romance between a seventeen year-old boy and a summer guest at his parents' cliffside mansion on the Italian Riviera. 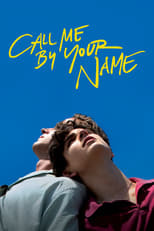 Call Me by Your Name is directed by Luca Guadagnino and was released on Jan 19th, 2018. Director Luca Guadagnino's Romance & Drama movie Call Me by Your Name is produced by La Cinéfacture & RT Features & was released 2017-09-01.